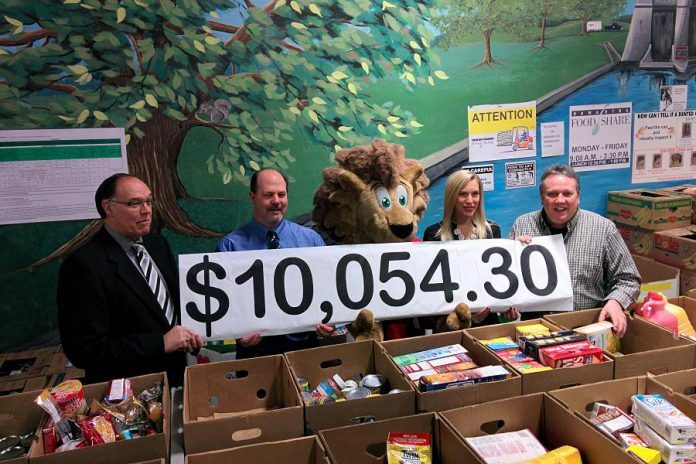 The City of Peterborough and the Peterborough Downtown Business Improvement Area (DBIA) presented a donation of $10,054.30 today to Kawartha Food Share. “The City of Peterborough is pleased with the completion of another successful Christmas Parking promotion in partnership with the DBIA,” says Kevin Jones, Transportation Manager for the City of Peterborough. Starting on the last Friday in November and throughout the month of December, people could park for free for two hours in downtown Peterborough. All money put into parking meters was set aside for Kawartha Food Share. Since 2003, the City of Peterborough’s parking division has partnered with the DBIA to provide two hours of free parking downtown in December and to donate money collected from parking meters to charity. Starting in 2014, the free holiday parking initiative began on Black Friday in late November. The initiative has raised a total of $98,110.81 since it began. Donations over the past two years have gone to Kawartha Food Share, which assists more than 8,100 men, women, and children every month through 37 member agencies. Services includes four meal programs, four city food banks, six housing projects, seven county food banks, and over 20 food cupboards across the City and County of Peterborough. Last year, the warehouse distributed over $10 million worth of food and emergency care needs.